◆ The product can be manufactured in accordance with either JB/T6939.1-2004 industrial standard, GB/T 19115.1-2003 national standard or users’ technical requirements. 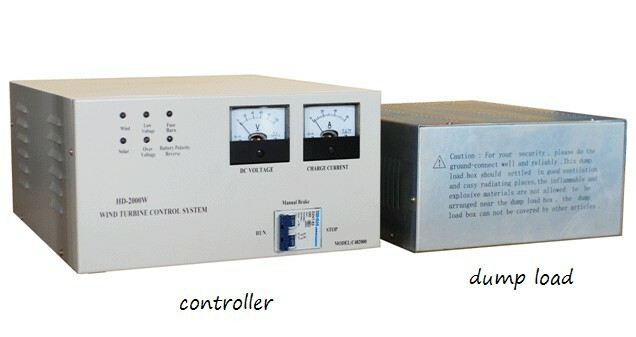 ◆ ZKJ-A controllers adopt multiple-line three-phase load discharging control. ◆ The total power of three-phase load discharging is 220% larger than the rated power of the wind turbine generator. The three-phase load discharging power of the first line is 80-100% of the rated power of the wind turbine generator; in case of exceeding the scope of the first line load discharging power, the three-phase load discharging of the second line will automatically start to ensure safe operation of the overall wind turbine generation system. ◆ Under the circumstances of decoupling and damage of the battery, the three-phase load discharging will automatically start to avoid the idle run of the wind turbine generator and the occurrence of runaway accident. ◆ It has reverse connection, anti-decoupling and damage-resisting protection of the battery. ◆ Over-charging protection of the battery: When the battery is full (the battery pressure reaching 125% of the rated pressure), the controller will automatically carry out three-phase load discharging to stop charging the battery. ◆ Auto recovery of battery charging: When the battery pressure reduces to 108% of the rated pressure, the load discharger will stop three-phase load discharging to automatically recover battery charging. ◆ According to the category of the wind turbine generator, the controller can be additionally equipped with mechanical yawing, swing-tai, mechanical or hydraulic, pneumatic, magnetic and other brake functions. ◆ LED status indication: Clearly present the working status of the wind turbine generator, solar panel, battery and controller. ◆ Ammeter and voltmeter indication: Indicate the charging current and voltage of the battery. ◆ The controller is equipped with manual three-phase load discharging switch; the user may use it according to actual circumstances. When using this switch, the wind turbine generator will forcibly carry out three-phase load discharging. Self-provided connecting wire of the battery >4 mm? >4 mm? >4 mm? Self-provided connecting wire of the battery >10 mm? >10 mm? >12 mm?